Bare Island is at the southern end of Anzac Parade, so car is the best way. It is approximately a 45 minute drive from the Gordon/Lindfield area, depending on traffic of course. Anzac Parade runs in a complete circle around the headland, and there is free parking all the way round, but it does get busy at weekends, so allow plenty of time to find a parking spot. We have organized a private tour of the Bare Island Fort to start at 2pm. We meet the tour guide across the wooden bridge at the entry to the fort. Please arrive a few minutes before 2pm. Bare Island also provides some great photo opportunities around the bridge and the rock shelf that surrounds the fort. There are some interesting rock formations and cliff patterns. The fort is at the entrance to Botany Bay, so there is shipping and boating, and other activities going on. 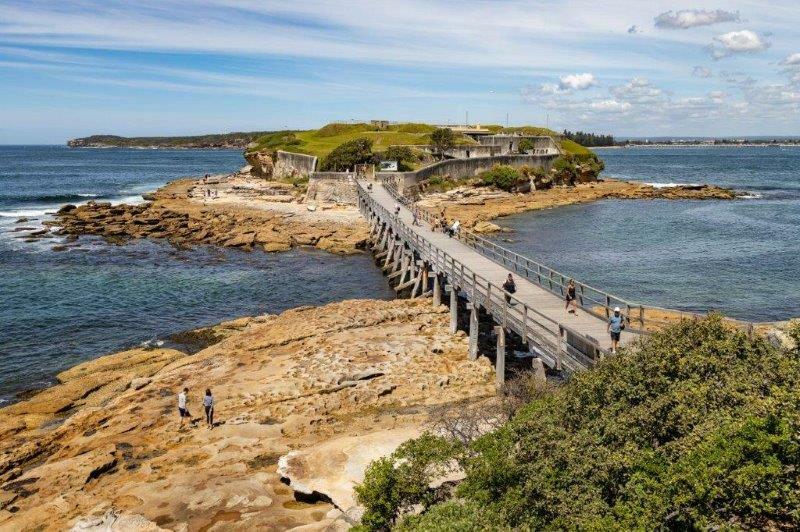 If you would like to get to La Perouse early there are a number of eateries (pub, fish and chip shop, cafes, etc) on the northern side of the headland within walking distance, so you could have lunch and a bit of an explore before the tour. You can take the first turning on the right as you leave La Perouse to the north on Anzac Parade. This is Henry Head Lane and you can drive right down to Cape Banks, or park close to the Golf Club (you can’t drive into the golf club unless you are a member!) and walk down to Henry Head or little Congwong beach. Car pooling - Please advise whether you need a lift from Gordon Station.